Last week we hosted a very interesting talk from Dr John Healey the Professor of Semitic Studies at the University of Manchester. John and his wife, Elizabeth, are just back from a visit to Iraqi Kurdistan, where they visited a number of churches and monasteries and also went to see the Chaldaean Archbishop of Erbil, Bashar Warda (who is a Redemptorist). We had a group of students from Syria and also a student from Iraq at the talk. It was very powerful, but also very depressing. Some of the most powerful interventions where from the students. One talked about her family in Damascus, who said to her recently ‘We don’t belong here any more’. Their family have been there for generations. Another talked about how he grew up in Baghdad with many Muslim friends and neighbours, but how a darkness had descended and they no longer mixed. It was distressing to hear – on one level we can only pray, but on another we started the first inter-faith soup run for the homeless in Manchester last week. Maybe moderate forms of Islam & Christianity in the West may eventually exert pressure back in those countries where the Christians are slowly being exterminated. One of my favourite Advent Hymns is ‘ O Come, O Come Emmanuel, and ransom captive Israel, that mourns in lonely exile here, until the Son of God appear…..’ This longing for peace from all forms of captivity and diminshment is a very powerful part of our advent prayer….. watch this below…… as a friend tweeted (@austeni)… Stunning. Listen, and pray. 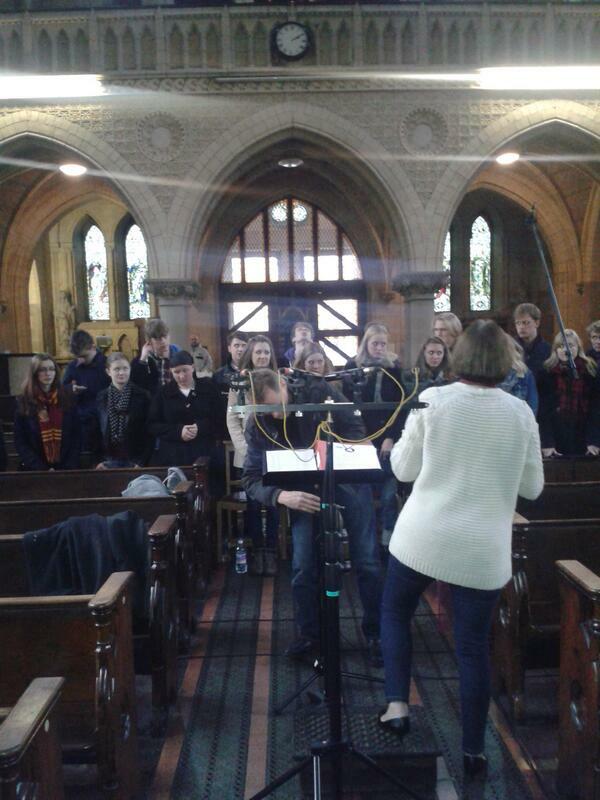 Today we were very lucky to host the Radio 4 Sunday Service here in the Holy Name Manchester . It has a UK audience of 2.5 million, and is streamed live all over Europe, as well as being available to listen again for 7 days on the BBC Website. On the internet it is a global audience. 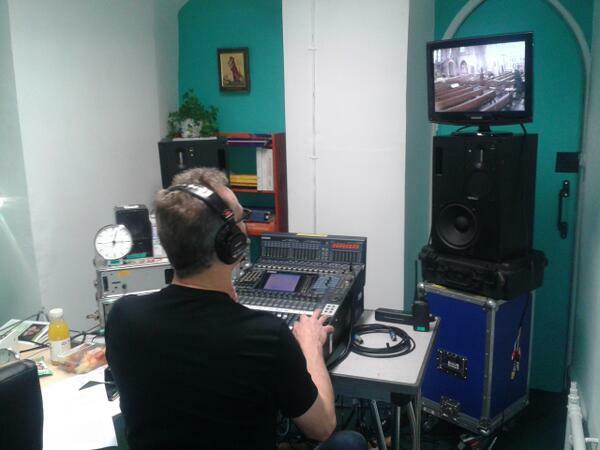 Because it is live – the timings are very tight – so a couple of times my homily was shortened (I bet the students wish that a Radio 4 producer came to all our masses !) 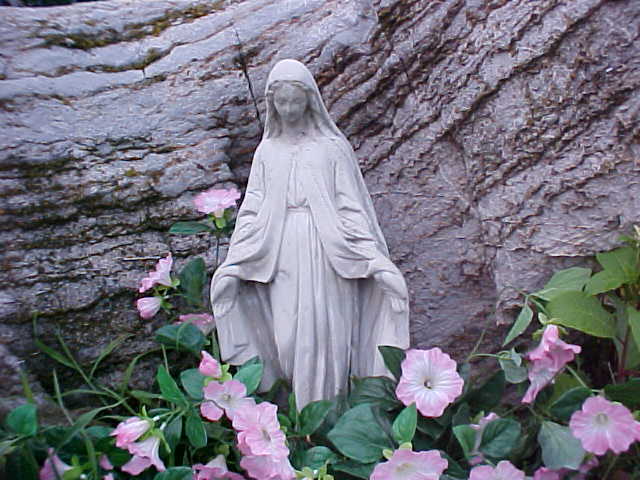 Here is the original homily I gave on the difference between optimism and hope. There is a profound difference between optimism and hope. Today is about hope – the feast of Christ the Universal King – He is the reason for our hope. Being around so many students here in Manchester fills me with optimism – their energy, their idealism, their passion. But optimism can be fragile – we can easily get sucked down into swamps of cynicism, or wallow in a culture that delights in mocking. We have just heard how they mocked Jesus on the cross ‘ If you are the King of the Jews save yourself’ Jesus is not the king of one ethnic group he is the universal King – In the midst of his suffering even the good thief senses this and rebukes them from his own cross – ‘Have you no fear of God? – and his reward is the promise of Jesus the King of Heaven – ‘ Today you will be with me in paradise’. Can you imagine how the good thief’s heart soared with Hope on hearing this unexpected promise? Hope is deeply rooted, Hope is more resilient than optimism, it doesn’t snap in the face of storms, nor does it wither away amidst hostility. Christian Hope is anchored in two places – firstly our belief in the bodily resurrection of Jesus, so we can hope in the face of inevitable death, we can even hope in the face of disaster. And secondly today we anticipate what the Catholic writer J.R.R Tolkien calls the ‘Return of the King’. That we look forward to Christ the King returning to bring about a new era of justice and peace for all people. When it seems that there is too much suffering and evil is flourishing, leaders are getting away with oppressing and killing their own people – belief in the return of Jesus is not just wishful thinking, delusional – but is a wellspring of hope. As a university chaplain I see the potency of that hope every day. Here in Manchester, our chaplaincy family consist of students from all over the world. They come from so many different situations, and what unites them is their faith, sometimes in the face of terrible persecution. Last week a young man from Pakistan told me how his family home was burnt down 6 months ago in anti-Christian Riots, students from Nigeria tell me with pride about the courage of their families who are going to church today even though there is a continual threat of bombing, the faith and devotion of a student from Syria, who is trying to help her family in Damascus is a constant inspiration. These are intelligent, professional, scholars, many of them scientists who appear to have an unshakeable hope in their hearts. A couple of years ago I was sent to the Philippines for my last year of training as a Jesuit. Part of that experience was to live in the shanty towns in Manila for a few weeks. The shanty town was very densely populated – with many people building houses on stilts out into Manila Bay. When I arrived they were recovering from a very strong typhoon that had destroyed many houses. It was a remarkable experience, to briefly share the lives of these people. Two things struck me – firstly how resilient they were. They did not have much – so in the typhoon they had not lost much, and as we helped them rebuild their houses there was great joy and freedom. Secondly how that resilience was rooted in faith and hope. This is so evident in the recent disaster in the Philippines. It is has been remarkable seeing how extended families have pulled together, we have seen this these weeks in Cebu and Leyte, how families have travelled to the disaster areas to help feed and rebuild their loved ones. The communities that are present and able to immediately provide that hope are not the politicians but the churches. Here in Britain we need communities of hope – our students here in Manchester have started the first student-run foodbank in the country. It is needed because so many have lost the support of family – have no extended family they can turn. But the student community here gives them hope, when they have to choose between heating their homes and eating – it is our foodbank that they can turn to which helps them through a short-term crisis, without creating dependency and also signposting them to other voluntary support groups. And it is remarkable how much of this civil society is faith based. They are communities of hope. We are called to build communities of hope, the church is called to take risks and we can’t just do it from the safety of the internet. There is a fascinating book by Sherry Turkle, an MIT Professor, called Alone Together – Why We Expect More from Technology and Less from Each Other. So let us expect and give more to each other. Pope Francis is challenging us to get out of our digital bubbles, and also to stop hiding behind our ceremonies – and go out and spread our hope especially to the poor. He has said the Church that remains in the Sacristy gets sick. We are being challenged to become a church that carries the hope that is rooted in our hearts to the edges and margins of society. Are we up to that challenge? A couple of weeks ago I read about the worlds luckiest / or unluckiest man – I couldn’t believe it. St Ignatius teaches that when you are in ‘desolation’ to sit tight, not to make a decision, it may seem as though the whole world is against you – but it won’t last . Here is a true story that puts that sage advice into perspective (via Neatorama)……… On a cold January day in 1962, a Croatian music teacher named Frane Selak was traveling from Sarajevo to Dubrovnik by train. Well, that’s where he thought he was going. Little did he know what he was actually about to embark upon a strange 40-year odyssey marked by freak accidents and near-death experiences. The train carrying Selak in 1962 inexplicably jumped the tracks and plunged into an icy river, killing 17 passengers. Selak managed to swim back to shore, suffering hypothermia, shock, bruises, and a broken arm, but very happy to be alive. 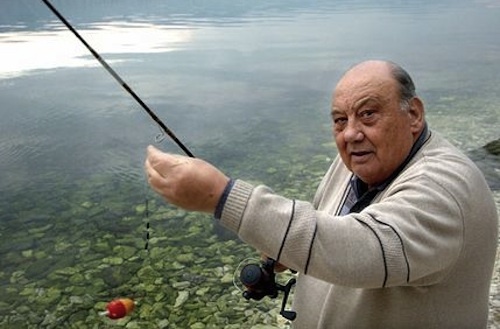 One year later, Selak was on a plane traveling from Zagreb to Rijeka when a door blew off the plane and he was sucked out of the aircraft. A few minutes later the plane crashed; 19 people were killed. But Selak woke up in a hospital – he’d been found in a haystack and had only minor injuries. In 1966 he was riding on a bus that went off the road and into a river. Four people were killed – but not Selak. He suffered only cuts and bruises. In 1970 he was driving along when his car suddenly caught fire. He managed to stop and get out just before the fuel tank exploded and engulfed the car in flames. In 1973 a faulty fuel pump sprayed gas all over the engine of another of Selak’s car while he was driving it, blowing flames through the air vents. His only injury: he lost most of his hair. His friends started calling him “Lucky.” In 1995 he was hit by a city bus in Zagreb but received only minor injuries. In 1996 he was driving on a mountain road when he turned a corner and saw a truck coming straight at him. He drove the car through a guardrail, jumped out, landed in a tree – and watched his car explode 300 feet below. By this time he was starting to get an international reputation for his amazing knack for survival. “You could look at it two ways,” Selak said. “I am either the world’s unluckiest man or the luckiest. I prefer to believe the latter.”How does the story of Frane Selak end? Luckily, of course. 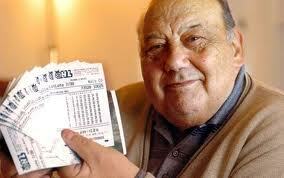 In June 2003, at the age of 74, Selak bought his first lottery ticket in 40 years … and won more than $1 million. “I am going to enjoy my life now,” he said. “I feel like I have been reborn. I know God was watching over me all these years.” He told reporters that he planned to buy a house, a car, and a speedboat, and to marry his girlfriend. …… In 2004 Selak was hired to star in an Australian TV commercial for Doritos. At first he accepted the job, but then changed his mind and refused to fly to Sydney for the filming. Reason: He said he didn’t want to test his luck! Following up on the story there is a very thought-provoking ending …… Now the pensioner has decided that “money cannot buy happiness” and has decided to live a frugal life.He has sold his luxury home on a private island, given away his fortune to family and friends and moved back to his modest home in Petrinja, which is south of Zagreb, in the centre of the country.He kept the last bit of his winnings for a hip replacement operation so he could enjoy life with his wife and also so he could build a shrine to the Virgin Mary to give thanks for his luck.